From amenities to the check-in and check-out times, we've provided a list of our most asked questions for your convenience. Still don't find what you're looking for? Feel free to contact us! Q: Where is the Fredericksburg Hospitality House & Conference Center located? A: We are located right off of I-95, exit 130B, and in the heart of Central Park. Click here for directions. Q: What is there to do in the area? A: There are countless gourmet restaurants, retail stores and entertainment all within walking distance of our front doors. Historic downtown Fredericksburg and the train station are a 5-minute drive and we are 50 Miles in between Richmond and Washington, DC. 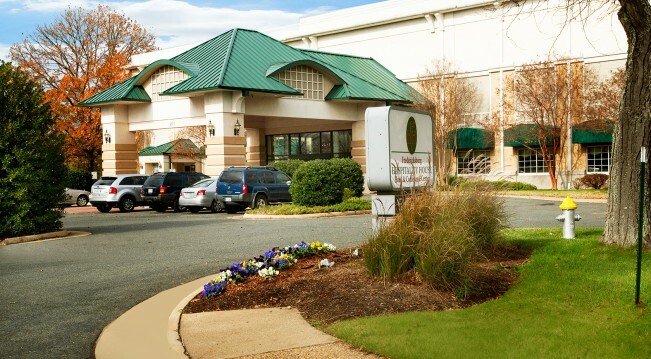 The hotel is also minutes away from the University of Mary Washington and the Mary Washington Hospital. You can also take a 20-minute drive to Quantico and the National Museum of the Marine Corps. Q: What amenities does your hotel and conference center offer? A: Our hotel offers high-speed wireless internet in all sleeping rooms and banquet space, an outdoor junior size Olympic pool, a cardio room, a business center, rooms that are all equipped with a balcony or a walkout, refrigerators, and microwaves in each sleeping room, two restaurants on site, live entertainment in our bar, 24-hour front desk staff, and complimentary self-parking for all guest. Q: Is breakfast included in my sleeping room rate? A: Yes, a full hot breakfast is provided for all transient guests daily. Breakfast may be served a la carte or served buffet style depending on occupancy levels. Serving time is 6:00 AM to 10:30 AM. Some group rates may not apply. Q: Do you have any restaurants or entertainment in the hotel? A: The hotel offers two full-service restaurants and one nightclub. Ledo Pizza is open daily for lunch and dinner service. Shannon’s Bar & Grille is open Wednesday night through Saturday night. Shannon’s Bar & Grille also offers live entertainment Wednesday through Saturday. All guest staying in the hotel will receive free admission to the live bands. A: Yes, we are a pet-friendly hotel. We allow guests to bring their pet, dog or cat, for a total up to 5 days. A $50.00 pet fee will be applied to the stay. All pet-friendly rooms are designated for easy access to the courtyard. Q: How do I secure a sleeping room block of 10 or more for special functions? A: For all sleeping room blocks inquiries, please call the sales department at 540-736-1005 for quotes and accommodations. Q: How do I secure a suite for my stay and what types of suites do you offer? A: We offer various suites and will be happy to discuss the options available for your stay. Please call the sales department at 540-736-1005 for assistance. Q: Do you offer any special packages that I can purchase for my stay? A: Yes, we offer a variety of packages that can be purchased to enhance your stay. Please give our front desk a call at 540-786-8321 and they can assist your needs. You may also read about the various packages here. A: The check-in time for all sleeping rooms is at 3:00 PM. The check out time is at 12:00 PM. If you have a request to check in before 3:00 PM, please note that all requests are not guaranteed. Please call the front desk for all special request regarding check-in and check out times. A: Please call the hotel’s sales department at 540-736-1005 for information about rates, availability of meeting and banquet space, related catering options, and sleeping room blocks.